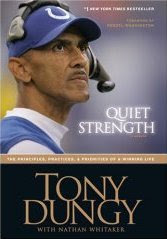 Tony Dungy’s bio, Quiet Strengthhas become a runaway hit, going into its 8th printing and staying in the New York Times bestsellers list for over 7 weeks. I got this book for my birthday and finished it two days. Its a great read with lots of insights about the unique life of a pro football coach. But the book has a lot more to talk about than football – it details the values, principles and spiritual insights of a great man who has been through all the highs and lows of a full life. Definitely check it out if you are interested at all in football and seeing into the character of a truly remarkable man. I agree. Thanks for recommending this book. It was a fantastic read and I blasted through it in a few nights. He truly lives his life trusting in God. I became a Colts fan after reading it – that is, as long as Tony coaches there!